He was only 46 years old and he had died the previous day, May 16th, at his parents home in Dover, so today is an anniversary of sorts. He came from a family of 8 children of whom only two got past the age of 50: an older brother who died at 51 and a sister who lived to the very respectable age of 83. However in his short and energetic life he certainly made a difference to Stony Stratford. He came to Stony Stratford as Vicar of St Giles in 1859. He had just got married, presumably on the strength of getting the living of St Giles. It has to be said that he made an enormous impact, certainly on buildings. He initiated what can only be described as a slum clearance by pulling down some old hovels and building what became New Street. He built a primary school on the same property. The vicarage on the High Street was inadequate, so he built a new one. And finally, his crowning glory, he built St Pauls School which was known in the 20th century as Mr Fegan’s homes. Sankey was the second son of William Sankey and Elizabeth Thompson.William Sankey senior was vicar of St James in Dover. Young William went to Oxford and followed in his father’s footsteps. The family was in comfortable middle-class circumstances but they were by no means wealthy. However, when W T Sankey arrived in Stony Stratford in 1859, recently married with a ready-made family in tow, he had money to spend and the ambition to spend it. Where did this money come from? Well, he appears to have acquired it by marrying a rich widow. I don’t wish to attribute any low motives of financial gain to this union. Sankey never used any of the money for personal profit and there is no reason to suggest that either party in the marriage was unhappy. His new bride was Jane Royds, formerly Jane Oddie, who, at the age of 40, was recently widowed from her first husband George and had lived in some comfort at Portland Place in London and latterly near St Albans. When her first husband died she had four children and Sankey, ten years her junior, was willing to take them on. George Royds figures in the 1851 census as a “Landed proprietor and fundholder” and his father was also living in London “of independent means.” One can only assume that Jane Royds came into her marriage with W T Sankey with a substantial bequest from her former husband. So while W T Sankey gets all the credit for his building program, it is as well to bear in mind that the money (and presumably her assent) came from his wife. I suspect that she had some influence on their decisions. For example, on their arrival in Stony Stratford they rented Wolverton House until the new vicarage was built, possibly because Wolverton House was the only house in the district grand enough to accommodate Mrs Sankey and her family in the style to which they were accustomed. They can be found in the 1861 census with her four children from her previous marriage, her new child with Sankey and four household servants – a lifestyle quite beyond the average small town vicar. 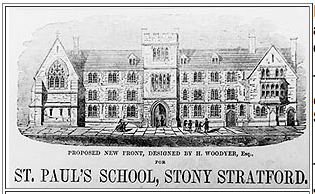 As I wrote in an earlier post the great 19th century venture into a private school in Stony Stratford was the building of St. Paul’s School, which opened for business in 1863. It was Sankey’s brainchild and he apparently had the ambition to create a school to rival some of the best residential schools in England. Land and buildings between The Malletts and the evocatively named Pudding Bag Lane were purchased. These buildings, including the ancient Horseshoe Inn, were acquired. 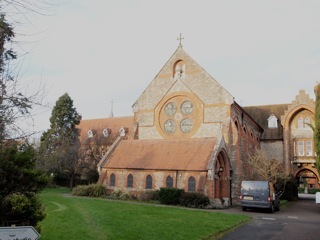 part demolished, and the new College and Chapel were built at a cost of £40,000. The school could accommodate up to 200 boys and under Sankey’s leadership appeared to have a good reputation. Unfortunately that reputation did not survive Sankey’s death in 1875 and under the headship of Walter Short appears to have degenerated into a kind of “Dotheboys Hall” where, according to Ratcliff, “The management having changed hands to men who ruled as tyrants, and wielded the birch incessantly, its reputation as a school soon became ruined.” Even in Victorian times, parents were not willing to pay 30 guineas a year to have their sons repeatedly flogged! Very, very quickly the school was drained of pupils and in 1882 the school closed. An attempt to revive it was made in 1888 but the harm to its reputation was such that it did not attract sufficient numbers. It closed again in 1895. this time permanently. The building had a short life as a cigar factory (of all things!) in 1896 and then lay empty for four years. It was rescued in 1900 by J W C Fegan, a wealthy man who dedicated his fortune to the provision of shelter and education for homeless boys. Known as Mr. Fegan’s Homes, the orphanage operated there for the better part of the 20th century. Fegan managed to acquire the property for £4,500, about one tenth of the original cost of the building. But it was a successful operation and survived until 1961. 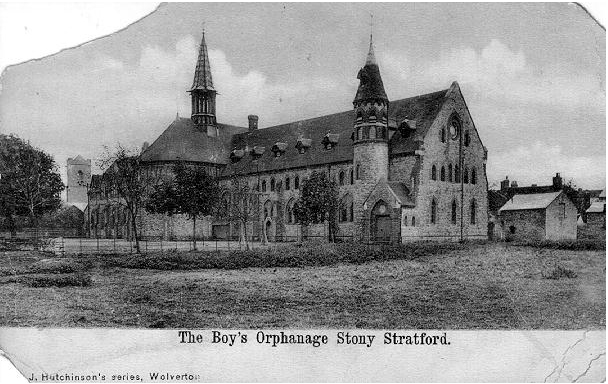 It has been estimated that over 4,000 boys were housed there and educated in the local schools, all of them characterised by their grey flannel suits. The orphanage was a feature of Victorian Society, being the only effective way in their eyes to care for orphans. Two world wars in the 20th century may have prolonged the life of the orphanage and by the time those orphaned by WWII had passed through Fegan’s society had found other ways of providing for children who had lost their parents. 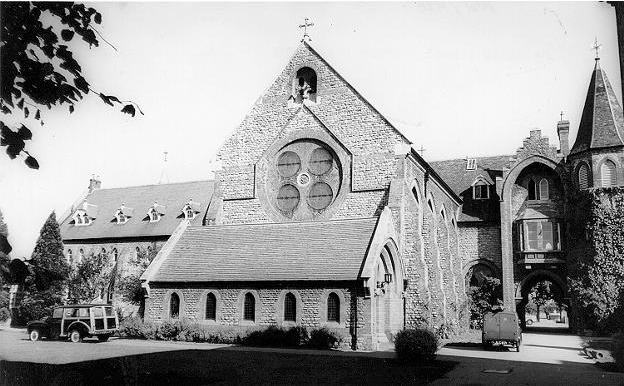 In 1962 the buildings opened as a Roman Catholic preparatory school, known as St Anthony’s. In this guise it lasted for 10 years. The site is now a commercial and housing development. It’s a curious and unfulfilled history. The original school had a promising start in Sankey’s lifetime and then fell on hard times through plain mismanagement. It’s 60 year use as an orphanage was a success until there was no longer a need for these kind of institutions. The latter day attempt to revive it as a more conventional school did not appear to have any lasting success. However, Sankey’s building program survives. Much of New Street is comprised of the original Sankey dwellings; the former school still sits on the corner at Vicarage Road, the Vicarage survives, and the St Paul buildings hold a commanding presence on the High Street. Quite a legacy for a vicar who was only there 16 years. Alfred Denny Blott grew up in Little Stanmore as a farmer’s son. It seems hard to imagine it now but Stanmore and Edgeware was very rural in the early 19th century and farming was the main activity. Alfred Blott was typical of many who grew up on the farm and came of age at the very beginning of the railway age and found a career in this new enterprise. He was barely 20 years old when he was given the task of Clerk-in-Charge at the new Wolverton Station, but as with so many jobs in the first days of the railways this was a new job. Nobody had done this task before. There was no experience of running a major railway in the 1830s. The job of station master was one such. The new station would clearly involve monetary transactions and records would need to be maintained so in 1838 this was a job for a man with training and experience in managing records and keeping accounts and they chose the young Alfred Blott. Mr. Blott was young but the directors obviously thought he would do very well. Early tickets were written out by hand and passengers were required to provide their name, address and date of birth, which may illustrate that our desire to collect useless data is not so recent after all. It took some years to develop more mechanized systems of ticket issuance. The key skill was probably identified as clerical and the title of Station Master only emerged after some years of operation. It is also worth bearing in mind that Wolverton was rated a “First Class” station in 1838 so Mr. Blott must have come with glowing credentials. In fact his preferment to this position is a good illustration of how hiring was done in those days. Mr. Blott’s father, William, was a farmer in Little Stanmore, on land historically owned by the Duke of Chandos and latterly, through marriage, by the Duke of Buckingham and Chandos. I imagine that William Blott had a word with his landlord who was then able to recommend the young Alfred for this new position at Wolverton. In the end, Alfred Blott turned out to be quite competent, although I do not think he was the first choice. This gentleman was G. Kendall who was discharged after a few weeks and Blott took up his position on September 29th 1838, twelve days after the line opened. I should add here that the title “Station Master” was not used in these early days – that was to emerge a decade later. He lodged in Old Wolverton until he married in 1843 to a Swiss-born wife Cornelia His starting salary was £100 per annum and by 1850 this was £200. I am sure that Mr. Blott would have stayed there and continued to raise his family in Wolverton. He was doing very well but in 1851 he was at the centre of one of those events that scandalized Victorian Britain – he eloped with a younger woman. that Mr.. Bevan be immediately suspended from duty as an improper person to have charge of the Oxford Station – That Mr.. Blott having expressed his willingness to go, be removed to the Oxford station on his present salary – reasonable expenses of removal to be allowed him – That Mr.. Shakespeare now at Stamford take Mr. Blott’s place at Wolverton at his present Salary, and that Mr. Boor who has for some time past done the Company’s business at Stamford take Mr. Shakespeare’s place provisionally. So it was finally settled, and it seems that the Company came out of it quite well. They effectively reduced the salary paid to the Wolverton Station Master by £50, replaced an incompetent station master at Oxford with an able one, and removed a stain of social embarrassment from Wolverton. Blott’s wife seems to have stuck by him as she was living with him in the 1861 Census. He only spent a few more years at the Railway before becoming Deputy Treasurer of an Oxford College. He died in 1868 at the relatively early age of 50 and his widow moved to Lewisham to live with her sister-in-law near to one of her sons who practised as an accountant. Charles Aveline was not a railwayman. He started up in business as a very young man and set up his shingle as a cabinet maker, furniture dealer and undertaker. The units were numbered 385 and 386 on Bury Street. Aveline was visiting relatives in London on the day of the 1851 Census so he does not show up in Wolverton on that date, but the trade directories of the period show him as very much a commercial presence in Wolverton. He had pedigree in the business although he was only in his early twenties at the time. His father George was a cabinet maker in Leighton Buzzard and he had an uncle Frederick established in the same line of work in Stony Stratford. His grandfather and uncle Samuel also were cabinet makers in Great Horwood. Young Charles therefore began his business with a set of skills, knowledge of the business and possibly some material support from his father. He also had an aunt who married into the Barter family who owned, amongst other things, the wharf at Old Wolverton. I don’t imagine he had much difficulty in accessing capital. A few years later he branched out into building, constructing several of the new properties on the private lots on the Stratford Road and Church Street and he also built the new Stacey Farm on the hill at the end of what is now Stacey Avenue. The first houses on the Stratford Road are also his. They are presently numbered 6,7, and 8 and I think he was the builder for a number of Wolverton properties. He was also the postmaster and I think the Post Office was managed by his wife and eldest daughter. The Post Office was at Number 6 and next door was leased to a grocer. Wolverton’s Post Office remained at this location until the new General Post Office was built on Church Street in the 1930s. In 1881 Aveline was employing 23 men according to the census entry, so his activities must have been quite extensive. His name also turns up as the maker of a number of monuments in St George’s churchyard. There were two sons and two daughters born to his wife Ann. She died in the 1880s and Charles remarried. In or around 1890 he retired and moved to Bedford. His eldest son George became a land agnet near Liverpool and his youngest son Charles Henry became a furniture dealer in Bishop’s Stortford. Charles senior died in 1914 at the age of 85 and left £9,692 0s 8d in his will – a significant sum for those days. George Spinks and his wife Eleanor occupied the northernmost property on Bury Street, number 384. It was beside the canal. In 1841 but they were described as running an Eating House. In 1851 the place is described as the “Locomotive Beer Shop” and it is also so described in an 1852 Trade Directory. This appears from the 1840 Binns and Clifford Survey and another plan drawn in 1845 to be a house with a corner entrance and an extension which was used for the eating house. I have made the assumption that this extension was a single storey only. The Beer Shop, as distinct from a Tavern, Inn or Alehouse, became possible through an 1830 Act of Parliament known as the Beer Act. It was designed to promote beer as a more healthy beverage than gin and enable any rate-payer to apply for a 2 guinea license from the excise authorities to brew and sell beer from their home. They were distinct from taverns and alehouses, usually larger operations, which were still required to get their license from the Justices of the Peace. So in the context of Wolverton the proprietors of the Radcliffe Arms and later the Royal Engineer would need to make application for their licenses to the local bench, whereas George Spinks needed only to pay his two guineas to the Excise and set up his own brewing pails to remain in business. Later in the century successive acts of 1869 and 1872 brought all establishments selling or dispensing alcohol under much tighter control. In fact the presence of Spinks’s Beer Shop was a source of some contention. The agreement between the Radcliffe Trust and the Railway Company was that no pubs would be built on Railway property. Accordingly the Trust leased land where Wolverton Park now stands to John Congreve and Joseph Clare (both of Stony Stratford) who rushed into building the Radcliffe Arms. Unfortunately for them, the L&BR built a new railway station to the south in 1840 and the Radcliffe Arms was thereafter isolated. The aggrieved Congreve and Clare then prevailed upon the Trust to lease new land in a better location and then built the Royal Engineer in 1841. This building still stands on the corner of the Stratford Road but was not at the time on railway property. In the meantime George Spinks was merrily operating with his Beer Shop licence and presumably taking customers away from Congreve and Clare. There were continual complaints until the building was pulled down in 1856 and Spinks moved away. A curious contemporary report from Hugh Stowell Brown presents a rosier view. At the station close to the canal bank there was a small temperance coffee-house, kept by a man named Spinks. A few of us thought that we might hold a Sunday School there. We obtained the use of the room, and started the Sunday School, and I taught there on Sunday forenoon and afternoon for some time. That was the first and for more than a year the only religious service of any kind in Wolverton. We might conclude, that whatever leanings towards temperance Spinks might have had, commercial realities gained precedence, although, as I have already indicated, beer was thought to have more wholesome properties than some of the distilled spirits on sale at the licensed inns and Spinks may have felt that this was consistent with his beliefs. I rather think that the worldly Spinks saw an opportunity to make some money out of the young and idealistic Brown by serving food when the shop would normally be closed. George Spinks was born in Spalding in Lincolnshire and somehow fetched up in Caernarvonshire where he met and married his wife and where their first child was born. By some means or other he heard of Wolverton and moved there in 1840 to set up his Eating House. Given the fact that the new population was largely male and single at that time I imagine they did a good business. They left Wolverton before the 1861 Census and I have not been able to trace them in the census indexes, even under variant spellings. The youngest daughter, Janet (Jeanett), appears in 1861 as a 14 year-old house servant in Lancashire, but the rest have proved untraceable without much more effort. It is my guess that the destruction of those cottages at the end of Bury Street in 1857 brought the business to its end and that the Spinks family moved elsewhere. While in Wolverton they ran a busy household. In 1841 they had four lodgers and a servant and in 1851 five children and a servant. There were a few great personages who had some impact on Wolverton and gave their names to streets and so on, but in the 19th century it was really the acts of ordinary people who shaped the community. One of them was Sarah Dunn. She was the wife of John Dunn, a smith, and they were both in their early forties at the time of the 1851 census. They may not have had any children although I cannot track them down in the 1841 census which might have confirmed this view. 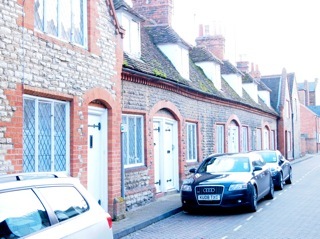 They have a 12 year-old niece staying with them in their rented house in Gas Street and a male lodger. In 1861 they have the whole house to themselves. John Dunn died during the next decade. I am not sure when exactly, but some interesting developments were taking place in the Roman Catholic community, of which the Dunn’s were committed members. From the early days of the railway the Roman Catholics at Wolverton Station were incorporated into the Parish of Aylesbury and their nearest mass was at Weston Underwood, nine miles away. Not an impossible walk for people in those days but a daunting one which meant trailing through Haversham, Little Linford and Gayhurst. Attendance at mass was in effect a whole day’s commitment. After 1860 the Roman Catholic community successfully petitioned the Bishop of Northampton who agreed to establish a parish at Wolverton. Father Francis Cambours was sent there in 1864 and he succeeded in raising £1000 towards the cost of a church. A year later he was replaced by Father William Blackman who was the parish priest number of years. He first lodged with the widow Dunn at 425 Gas Street and I suspect that for a time it served as the Presbytery. 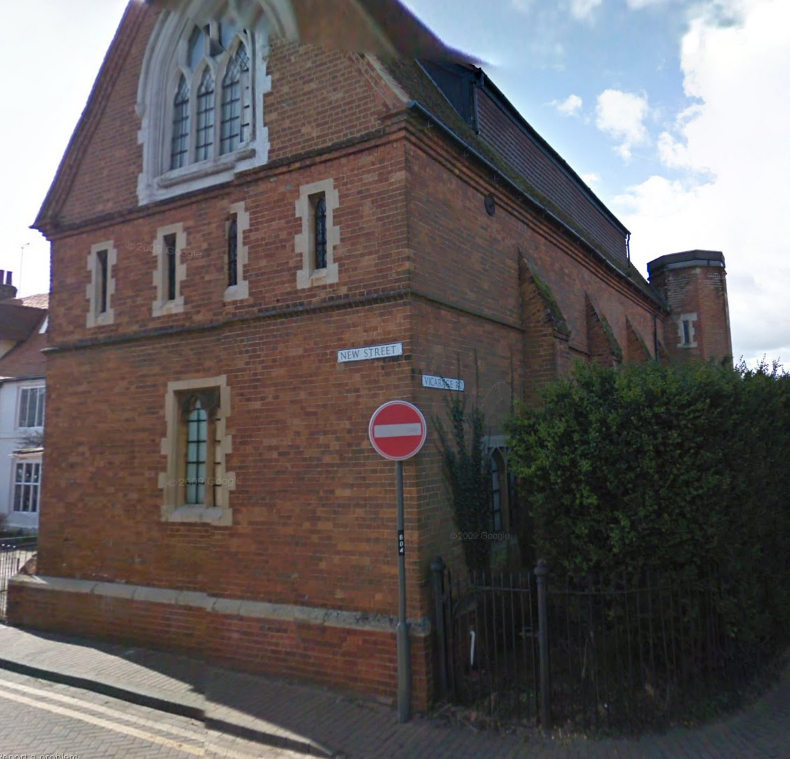 The new church, built on its present site on the Stratford Road opened in 1867 and was built at a cost of £885. Four years later a Presbytery was built next door to the church and apparently Sarah Dunn contributed over £200, probably her life savings, to this building project. She moved in with Father Blackman to serve as his housekeeper until her death in 1884. 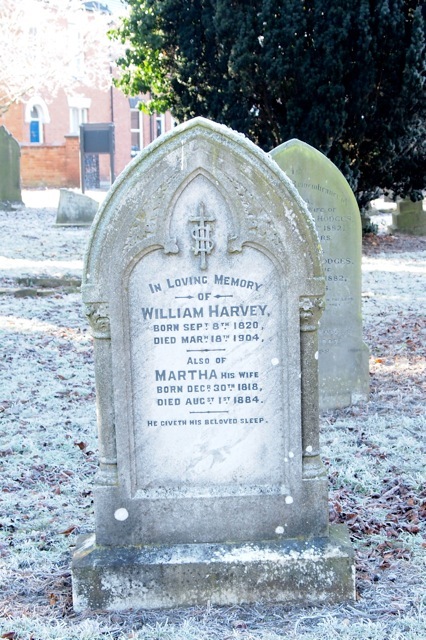 William Harvey was one of that army of new men who came from all parts of the British Isles to work at Wolverton. He did what many of his contemporaries did – he worked hard, earned good money, settled in Wolverton and raised his family there. His life is no more remarkable than that except that we know a little about him from Hugh Stowell Brown’s autobiography, and because of this, and Census records, I am able to write a little about his life. He stands in my mind as typical of those pioneers who made Wolverton what it later became. He was born in Darley Abbey, just outside Derby in 1820 and probably came to Wolverton in 1838 when the new Engine Shed needed new workmen. Hugh Stowell Brown came to Wolverton somewhat later and eventually the four young men who also included Edward Hayes and William Mickle decided to find lodgings together. They shared a room in a tiny cottage at Old Wolverton (which probably no longer exists). The agricultural labourer who opened his house to them was William Cox, who was in 1841 living there with his wife Ann and two daughters aged 15 and 9. I imagine that they shared one bedroom and the four young men the other. Brown describes a small downstairs back room which they were able to use as a study. Brown writes “ Harvey was a Derbyshire man, one of the best workmen in the place, and gifted with a dry and pleasant humour.” he doesn’t tell us much more but I am left with the impression of an unassuming but industrious man – the kind who gets on with the job in hand without a great deal of fuss or fanfare. At any rate we can follow the rest of his life through public records. In 1844 he married Martha James and they had two daughters, Mary Jane, named after the two grandmothers, in 1847 and Ann, at the end of 1850. Harvey worked most of his life as an Engine Fitter, a job which required strength and technical knowledge. He was still working at the age of 70, but then recorded as a Brass Finisher, which was presumably lighter work. The family first lived in Young Street but when new houses were opened up on the Stratford Road hey bought a new house at 24 Stratford Road and lived there for the rest of their lives. The house is still there and is now one of the oldest surviving houses in Wolverton. The two daughters grew up to become school teachers until they married. Mary Jane married a Wesleyan Minister and moved to Cheshire. Martha died in 1884 and was outlived by her husband for a further 20 years. After her death he employed a housekeeper. Were it not for Hugh Stowell Brown’s lines I don’t expect I would have paid attention to William Harvey but his story stands for many of his generation who were born before the invention of steam railways and who came of age at the moment of their inception, and, who subsequently lived their lives in a railway environment.